Tessellation is the tiling a surface (in this case a flat surface) without gaps and overlaps. This concept is very important since many of the floors and walls are tiled nowadays. But tessellation is a lot more than that. It actually obeys the law of mathematics particularly angles. 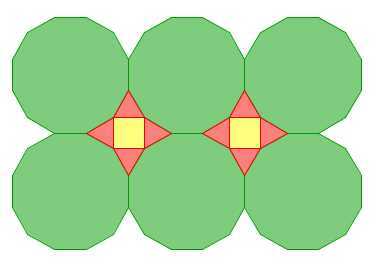 The plane can be tiled with just one polygon as shown below. Some of such types of polygons are squares, triangles, and hexagons. Can you think of other shapes that can tile the plane individually? The plane cannot always be tiled by a single shape. Some polygons maybe combined with other polygons to do this. The tessellation below is composed of 12-sided polygons, squares, and triangles. In this post, we explore the properties of regular polygons such as the one shown in the first figure. Aside from these three, are there other regular polygons that can tessellate the plane? The answer is none. Before we prove this theorem, let us first observe what make squares, equilateral triangles, and regular hexagons unique. As you can see in the figure below, the sum of the interior angles meeting at a point is 360 degrees. Now, make the notation (n,a), where n is the number of sides of the polygon and a be the number of angles that meet at a point. Using this notation, we can describe the square as (4,4), the triangle as (3,6), and the hexagon as (6,3). We will show below that these are the only possible regular polygons that will tessellate. Theorem: The only regular polygons that tessellate are square, equilateral triangle, and regular hexagon. Multiplying both sides of the equation above by , we have . Dividing both sides by 180 results to which simplifies to . Next, we add 4 to both sides to make it factorable. That is $latex . Factoring out we have . Notice that the only possible ordered pair (n,a) for this to be true are (4,4), (6,3) and (3,6). These are the representation of square, regular hexagon, and equilateral triangle respectively as we have stated above. Therefore, they are the only polygons that can tessellate the plane.